I spent Saturday morning at Portland, fishing in 45m SW of the rocks. The bait of choice was live arrow squid drifted or trolled behind the yak. Unfortunately no breams were landed up but as some bustups got close the squid rod went screaming off and in less than 30 seconds the Slammer 760 (not a small reel) spooled with 50lb braid was half gone and even though I was dialing up the drag whatever it was showed no sign of slowing down. In probably 30s (time is difficult to quantify when a reel is screaming in pain) the leader popped. After re-rigging I nearly hooked a big seal with the next squid, and while trying for more livies I got a pinkie, a couta, a wrasse and a sadly barotrauma-ed barber perch - and still no breams. After that the wind picked up and I headed back to the beach. A few boats came by to see if I was ok, which I was (apart from the lack of breams) but the gesture was appreciated nonetheless, one crew even offered me a beer. Today I went down for a second attempt at the bream but the wind looked like it was up a bit so I pulled the pin without launching (this is what kayakers do when they don't want to be on the news and/or die), packed up the camp and went home. A word of warning to fellow bream fishos heading to Portland - the coffee at the Port Fairy BP is ghastly and I doubt it is single origin or even fair trade. They're the kind of fish that offer just the right balance of challenge and reward that keep both kids and experienced anglers alike smiling. Bream like hideouts in areas that are a bit sheltered from the current and where there is structure, cover, and readily available food. 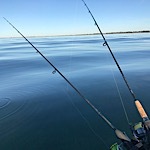 So, places like jetties, boat ramps, rock walls, pontoons, oyster racks, and areas with overhanging trees are good places to target when chasing bream with bait. It's worth noting that bream can be caught on lures in estuary shallows and targeting them here at high tide when it's a bit cloudy and there's a bit of wind can be very productive.